Mostly this page is fully of recommendations of things to buy. These things are all pretty cheap and almost certainly worth it. Based on the current prices, if you bought this entire list of 5-6 items, it would only cost you $48, or $68 with the black light. Disclosure: I have Amazon referral links turned on. But the point of this page is to make you happy (and me not have to repeat myself) …not to make me money. My bedroom is north-west-facing, in Canada, which means that in the morning (especially in winter) it can be very, very dark. 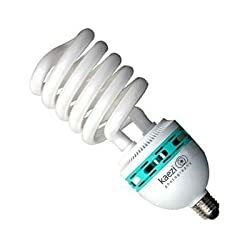 This giant 85W Compact Fluorescent bulb isn’t nearly as intense as a proper SAD Light Therapy lamp, but it’s also like 10× cheaper! (It’s only $15) Honestly, if you ever find yourself thinking “my room is too dark” then just buy one of these already. Warning: it’s really, really bright. You probably don’t want to look at it. That means you’ll probably want to put it in an overhead fixture. You could put it in a lamp, but it’s also really really big (for a light bulb)… like the size of a large salsa jar. Large. Like look at the image, and how tiny the plug part is. That’s a normal size plug part. The tube is just massive. So it probably won’t work on the lamp of a neck that bends or flexes. The top of a rigid lamp could work well though. To make a long story very short, humans produce a hormone in the evening called melatonin. The way that the pineal gland knows that it’s nighttime is by the absence of blue light. Red light also doesn’t mess up your night vision (because night vision is cones and cones mostly respond to green light). So in general having nighttime be less blue and more red is awesome. Here’s how I do it. Red CFLs are awesome. When I first ordered one, I tried turning it on in the day and was like “welp, that was a waste of money” because it was just a dim glow. Then I tried it again at night and was like “man the room is dark… but I CAN SEE EVERYTHING :O” If you’re fairly close, it can be enough to read by. 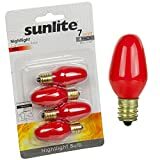 At some point you’re going to start running out of sockets (especially if, like me, you also like to have the warmth of a classic incandescent in the early evening before turning on your red CFL. You also probably don’t want to hide the red light in any kind of lampshade. To solve this, I recommend something like this cord. The switch on the side can also make it easy to turn off from your bed. And there are a few other things which are not lighting but are really helpful. 1. f.lux, which makes your computer screen reddish in the evenings which is softer on your eyes and also good for melatonin. Download it for free here. I also really like blacklights. Most people don’t know that cheap, standard highlighters (most colors) can be used to draw on people and make them glow different colors under blacklights. Gel pens too, though they tend to be less bright. I don’t have a preferred brand of markers for blacklights yet. Sharpie Neons work well, but Sharpies (presumably including neons) contain some substance that’s not good to have on your skin that much… but fine in small amounts. I quite like this blacklight by American DJ. I got it for a party and it was nice and bright. I sometimes use it just to make my room more surreal though. 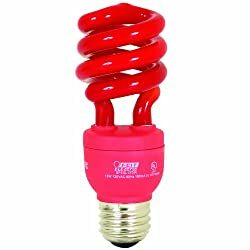 If you combine it with the red CFL mentioned earlier, it has a really neat effect. The structure of my hand, illuminated.